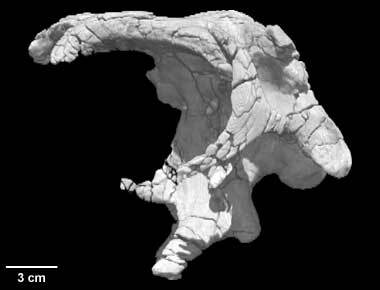 This braincase was found among postcranial material of the holotype of Diplodocus hayi; the original museum number was CM 662 (Carnegie Museum of Natural History). It is unknown whether this specimen is referable to hayi or represents a different species. It now resides in the Houston Museum of Natural Science. It was made available to the High-Resolution X-ray CT Facility for scanning by Dr. Timothy Rowe and Dr. Wann Langston of the Department of Geological Sciences, The University of Texas at Austin. Funding for image processing was provided by a National Science Foundation Digital Libraries Initiative grant to Dr. Rowe. The specimen was scanned by Richard Ketcham on 23 October 1998 along the horizontal axis for a total of 195 slices, each slice 1.0 mm thick with an interslice spacing of 0.8 mm (for a slice overlap of 0.2 mm). To cite this page: DigiMorph Staff, 2003, "Diplodocus sp." (On-line), Digital Morphology. Accessed April 24, 2019 at http://digimorph.org/specimens/Diplodocus_sp/.